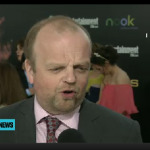 New Picture of Toby Jones at the Hunger Games Premiere! Toby Jones plays the announcer for the Games, Claudius Templesmith. He seemed genuinely surprised when the fans screamed out his name. We will be continuously updating this post. Stay tuned! Gary Oldman may play the leading role of George Smiley in the screen revival of John le Carre's 1974 novel, Tinker Tailor Soldier Spy but this depiction of a Cold War MI6 has some serious talent in its ranks. Smiley's people include reigning best Oscar winner Colin Firth, as well as veterans John Hurt, Ciaran Hinds, Mark Strong and Toby Jones. And it even has room for two bright young things - the brawny Tom Hardy and the captivating Benedict Cumberbatch. The task of condensing a 400-page novel into a sleek feature film running just over two hours, while retaining the nuance of the story and characters, proved a daunting task for the British screenwriting couple Peter Straughan and Bridget O'Connor, who has since died of cancer. Straughan points out that choices had to be made in the 1979 mini-series too. "A couple of characters were cut, even though they had seven hours. We never intended to do the whole book. We had to find a fillet to cut out and go with that." 12 Big films for 2012! Kristen Stewart and Chris Hensworth team up as the title characters to take down an evil witch played by an icy-cold Charlize Theron. Iron Man (Robert Downey Jr.), The Hulk (Mark Ruffalo), Thor (Chris Hemsworth), Captain America (Chris Evans), et al, join forces under the guidance of Samuel L. Jackson, aka Nick Fury, to stop Thor’s brother, Loki (Tom Hiddleston), from destroying all of mankind. Filling out the cast (nicely) is Scarlett Johansson as the Black Widow and Jeremy Renner as Hawkeye. Joss Whedon (“Buffy the Vampire Slayer”) directs. Director Ridley Scott revisits “Alien” territory with this quasi-prequel in which a team of space explorers encounter a dark, menacing force bent on the destruction of humankind. Noomi Rapace (the original Lisbeth Salander) leads a cast that reunites Charlize Theron with her “Young Adult” co-star, Patrick Wilson. Star-crossed lovers Bella and Edward conclude their romance in the final chapter of Stephanie Meyers’ bloody good (or bad, depending on your viewpoint) vampire epic. And at the center of it is their adorable offspring, Renesmee, who is creating woe for the entire Cullen clan. Thanks to our admin T for the pics!